Jason Day has received Australian golf’s most coveted award taking out the inaugural Greg Norman Medal tonight on the Gold Coast. Receiving the award as Australia’s best performing Tour Professional on the international stage, it’s been a year of significant success for the Queenslander who was a standout choice among the judging panel. This is the second national award for Day, who was bestowed with the 2015 Don Award from the Australian Sports Hall of Fame in October. “On behalf of the Australian golf industry I congratulate Jason on winning the inaugural Greg Norman Medal and convey how proud we are of all his achievements this year,” said Brian Thorburn, CEO of the PGA. Greg Norman, who was also in attendance, echoed Thorburn’s sentiments that there was no one more deserving of the accolade than Day. Day, who was unable to attend the evening, appeared via video link with his mother Dening Day accepting the award personally from Greg Norman on behalf of her son. “It’s an honour and a privilege to win the Greg Norman Medal, it caps off an amazing year,” said Day. It’s been an incredible year for Day, who opened his 2015 PGA TOUR campaign solidly with a victory at the Farmers Insurance Open before going on to secure a further four victories on the Tour this season. 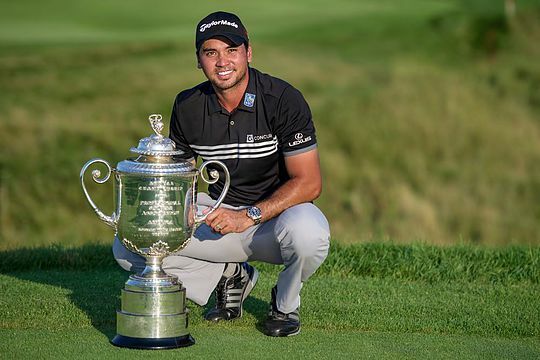 However, by far the standout achievement of the year for Day was claiming his first Major title, the PGA Championship at Whistling Straits, before rising to Australia’s newest World Number 1. Day also finished tied fourth at The Open, tied ninth at the US Open and finished third on the FedEx Cup rankings. He was also the highest ranked qualifier for the International Team at The Presidents Cup. Day was one of eight nominees in the running to take out the award with Adam Scott, Matt Jones, Marc Leishman, Steven Bowditch, Karrie Webb, Minjee Lee and Rebecca Artis also up for golf’s most prestigious award. The evening saw members of the professional golf circuit, corporate world and golf community gather to celebrate the achievements of both Tournament and Vocational PGA Professionals. Complementing the pinnacle award was the 2015 PGA Tour of Australasia Player of the Year, awarded to Matthew Millar, and the 2015 ALPG Player of the Year, which was awarded to Su Oh. Millar made a solid start to the season finishing runner-up at the Coca-Cola Queensland PGA Championship in February before winning his first PGA Tour of Australasia title at the Holden New Zealand PGA Championship in March. Millar hasn’t missed a cut on the PGA Tour of Australasia this season and has secured nine top-10 finishes from 12 starts. The night also saw Jarrod Lyle honoured with the PGA TOUR’s Courage Award after overcoming two battles with acute myeloid leukaemia. Lyle is in the second year of a Medical Extension granted to him due to his life-threatening illness. The Greg Norman Medal dinner, which is proudly supported by the City of Gold Coast, tees off the PGA’s flagship tournament, the Australian PGA Championship, at RACV Royal Pines Resort on the Gold Coast from 3-6 December.